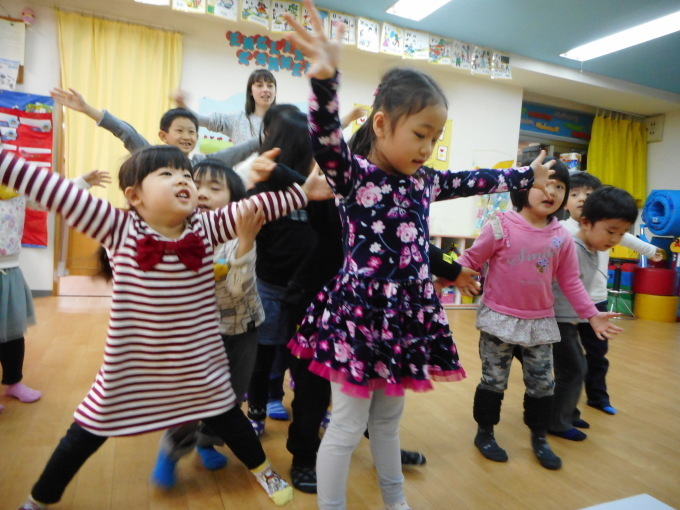 Today the Butterfly kids had an English review lesson. We wanted to find out if the kids still remember what they've learnt so far. 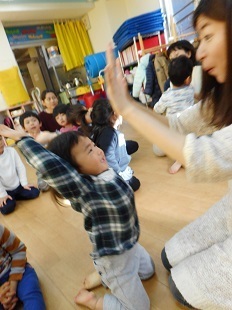 We played a game where the kids had to say, "Hands up" or "Hands down" and other instructions. They're so brilliant. 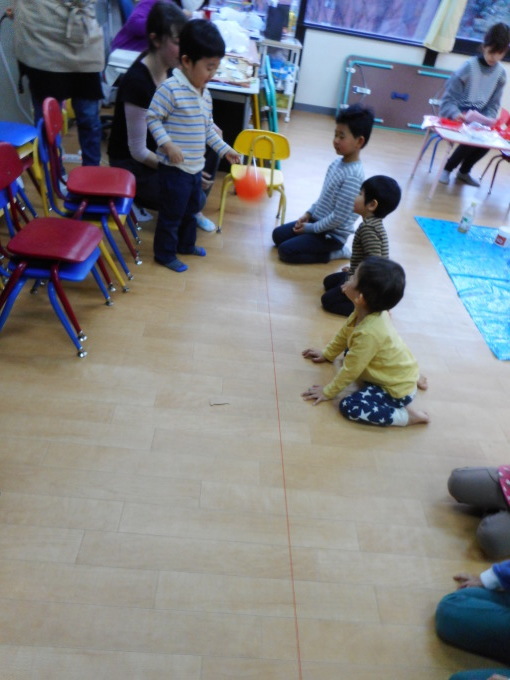 Then, we played another game where they sat in circle and counted 1-10. It was so much fun. Lastly, we reviewed the adjectives we learnt so far. The kids sang the adjectives song one more time and they had so much fun singing in fast and slow tempo. In the end, they had a small roleplay, asking each other, "Is it a blue jacket?" "Yes, it is." "No, it isn't." Meanwhile the Caterpillar kids went to an area nearby the waterpark. It was such a cold day but they had fun outside. 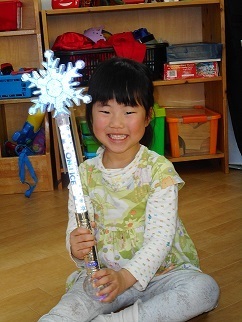 They brought along their usual toys, the hula hoops, the jumping rope, etc. They pretended they were train and rolled the hula hoops around. The kids were super thrilled to be spending their afternoon outside. 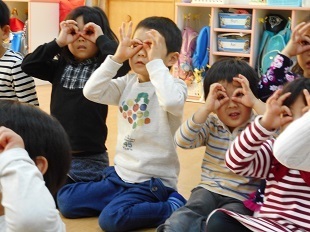 Today the Butterfly kids had their Math lesson. They did another Math puzzle. Some numbers were shown on the board and they had to guess the word they corresponded with. 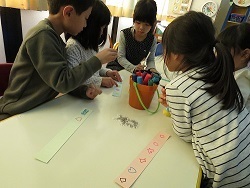 The hints were shown where specific numbers were assigned to specific Japanese characters and by using the clues the kids were able to guess the word. They wrote a letter to their friends while solving the puzzle. They used words such as "Thank you" etc. in their letter. It was easy for the nenchos to write the letter, a little bit more challenging for the nenchus but both group managed to pull it off. It was trickier for the nenshos but they managed to trace the letters. Good job! Meanwhile the Caterpillar kids had their English lesson. They first sang the number song again. It was so much fun! Then, they all gathered to play the 'Number Game'. The kids rolled the dice and picked the right number. They were all pretty good at recognizing the numbers. Good job everyone! 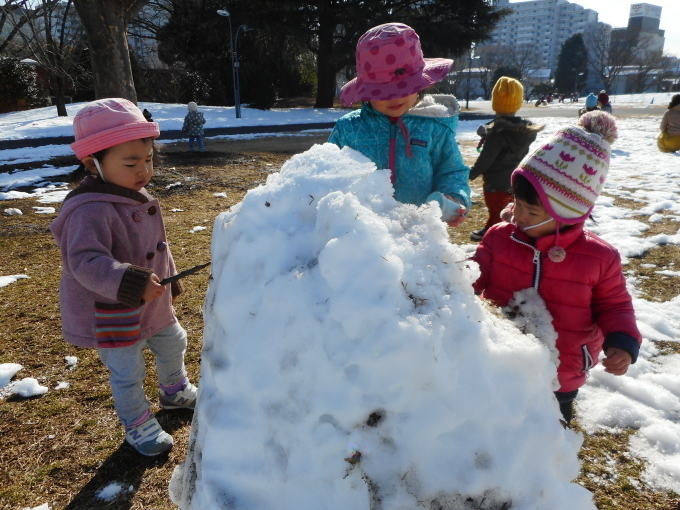 This morning we could play in the snow at the Showa Kinen Park, caterpillar and butterfly classes. 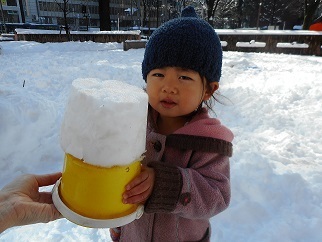 Some of caterpillar kids played with many toys that we brought as shovels and buckets others tried to run on the snow which was very difficult especially for the youngest children but they could walk as well. 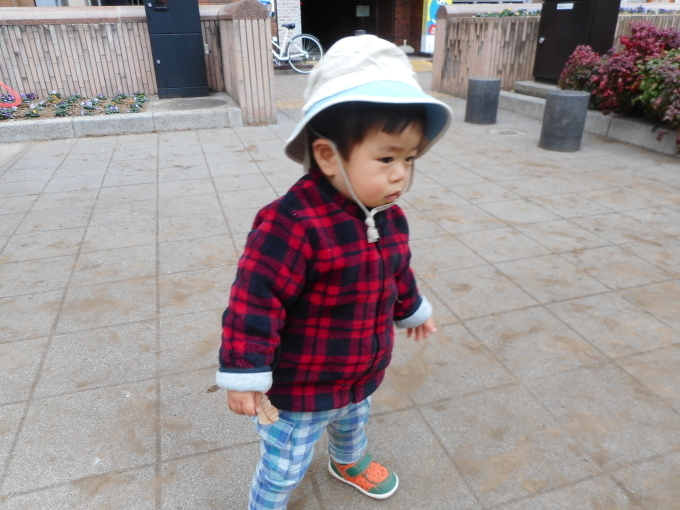 We`ve seen a lot of dogs at the park and I believe the kids love them so much. 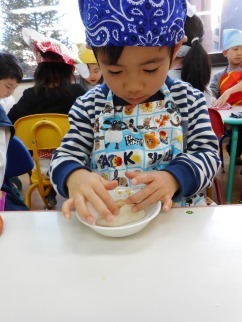 Then, we came back to the school and had a lunch all together made by Tomomi teacher. The menu consisted of fish, salad, soup and fruits, accompanied by tea . 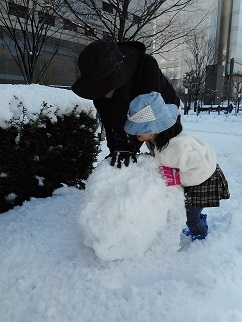 Meantime, butterfly kids were trying to make snowman which was difficult due of the milted snow. 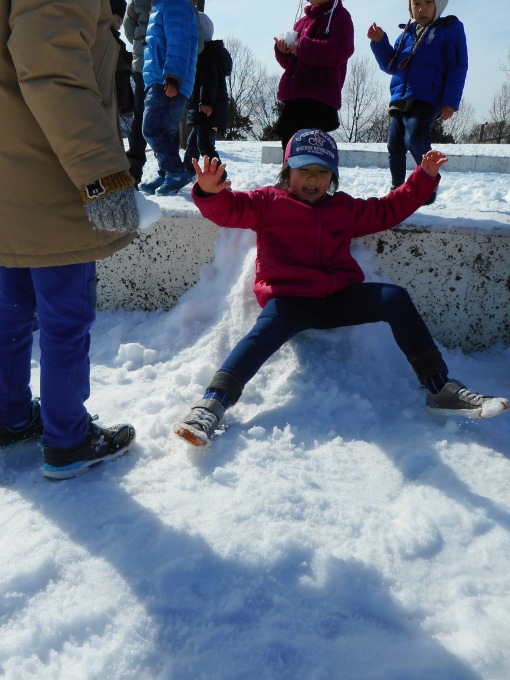 There are actually many stairs at this park so they gathered the snow on these ones in order to create a kind of ski hill where they could slide all the way down. 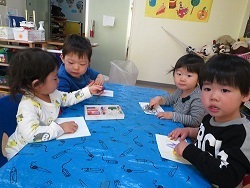 After that, they came back and also had a lunch all together on the butterfly class. 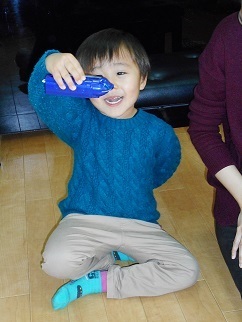 The older kids were learning how to sew and making clothes, I think they were all exciting about this new activity during the others were sleeping. On this afternoon, we made our first balloon rocket made of yarn, straw, tape and balloon. We tied the yarn to the back of a chair fallowed by threading the straw onto the other end of the yarn and finally tied it to the second chair. We attached pieces of tape to the center of the straw and fixed it onto the balloon. 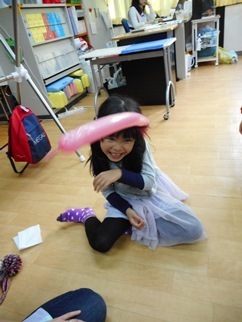 We inflated the balloon and to one end of the yarn we let the balloon go. 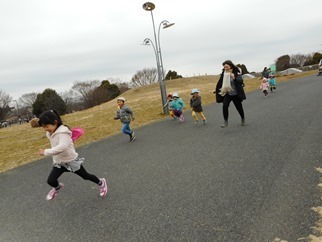 Nobody wanted to stop, we kept continue this activity during 30 minutes. We also experimented chemical reactions, first, we observed how baking soda and vinegar react once mixed together. 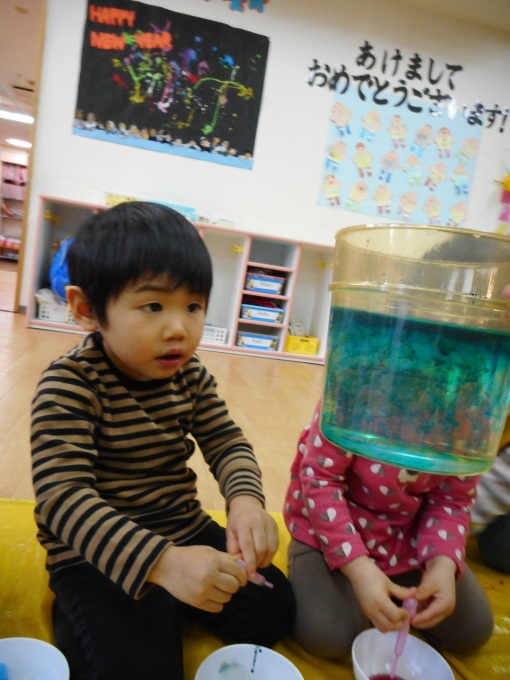 Then we mixed food coloring with oil and fed into a transparent container filled with water. Both reactions were breathtaking even for the teachers. That was a beautiful Saturday spent with you. 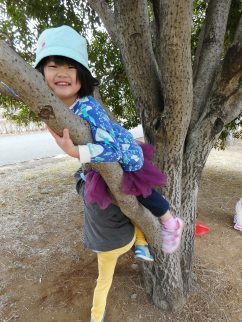 Today is special because we are going to celebrate four of our friend`s anniversaries which are Kanon, Sarah, Shiori and Kahel ones. 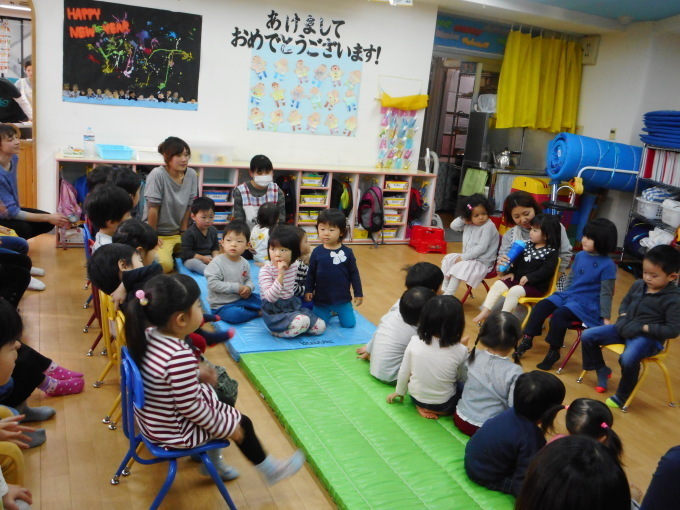 We all gathered in the butterfly class to having an interview with each of them, their comrades were asking many questions as ; what is your favorite color? or what is your favorite meal? 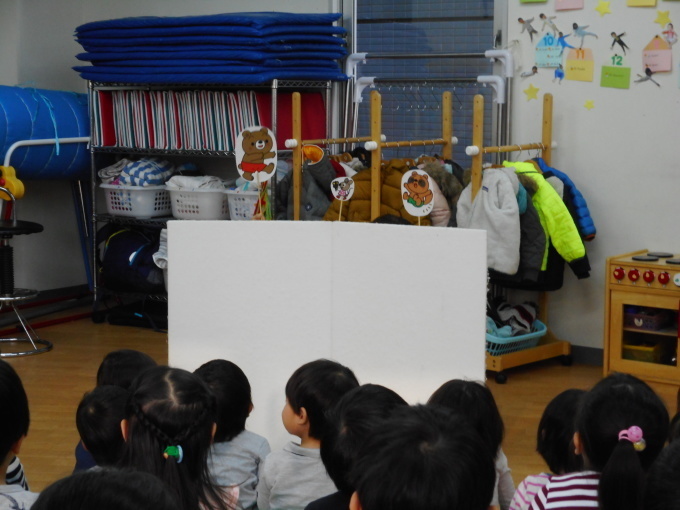 Then, we sang the Happy Birthday song fallowed by Mai teacher`s play which was great and funny. 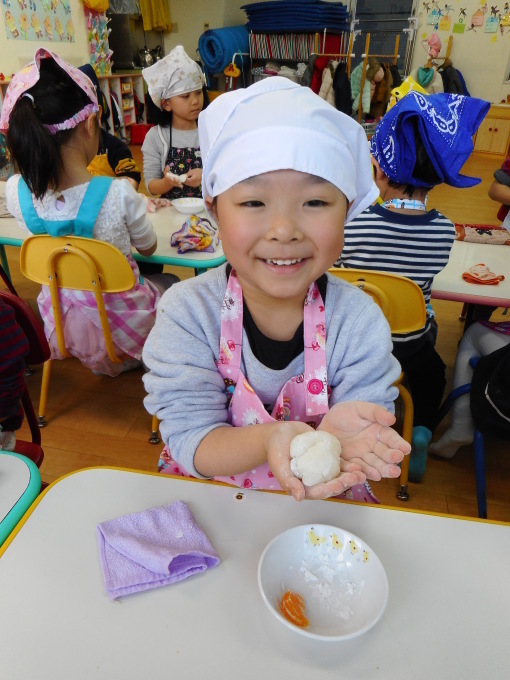 For the occasion, Encho Teacher sang a Japanese song before we all moved to the caterpillar class where delicious pieces of cake, made by our chief cookers Tomomi and Akiko, was waiting for us. After, we read books in the butterfly class all together. What a great celebration that we had, it is always pleasant and wonderful to share these good memories with all of you. 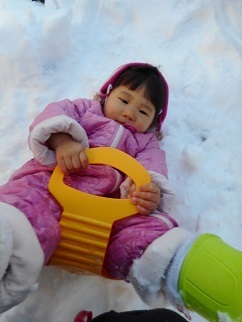 Even though the fresh and cold wind is still here this morning, nothing can stop us we still going to have fun out there! 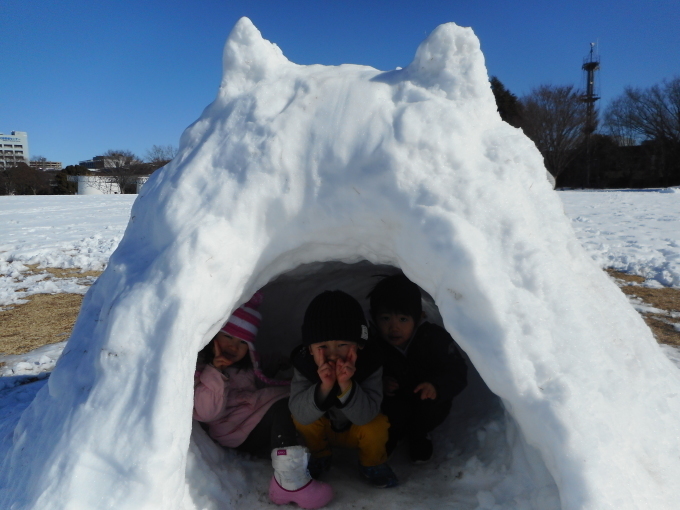 Caterpillar class went to the Showa Kinen Park where they played in the snow and they even could find an igloo made by someone. 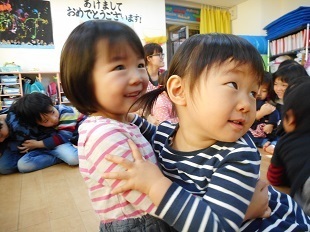 They played around and had a great time before they went back for having a lunch cooked by Tomomi teacher. 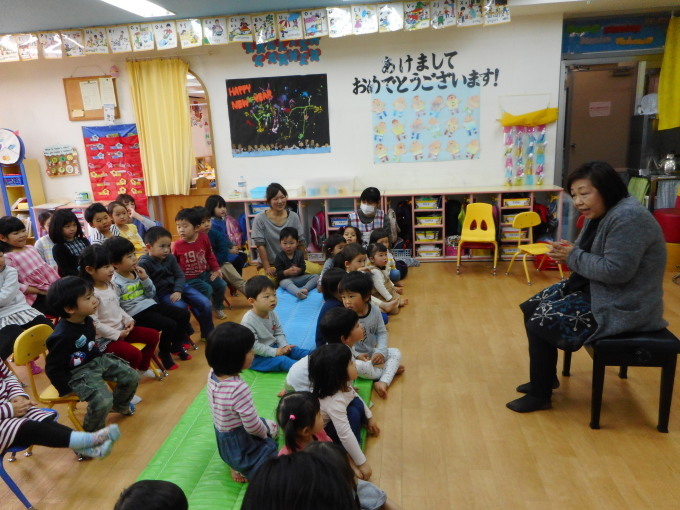 Meantime, butterfly class was having English lesson giving by Aina teacher and me. 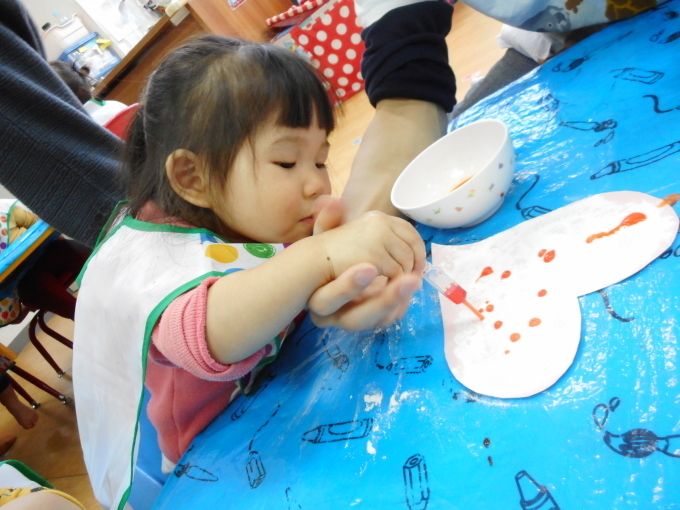 Today it was the Art and Crafts that normally we have once in the month. As you probably already know, February is the month of love, there is a very special day which is called Valentine`s day. This day is dedicated for all the people in our surrounding that we love and sharing. 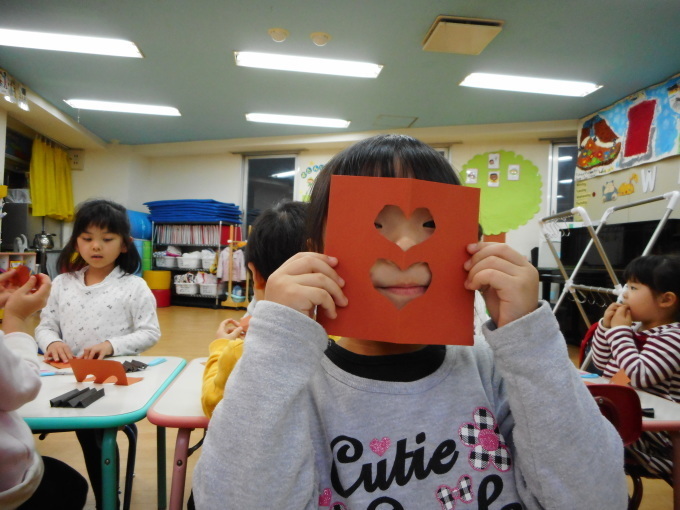 Aina teacher decided to make heart flowers for this occasion. We had a lot of fun and we can`t wait to show you what we did for you. 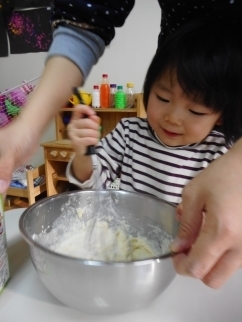 This afternoon, butterfly class had ABC lesson giving by Aina and me. 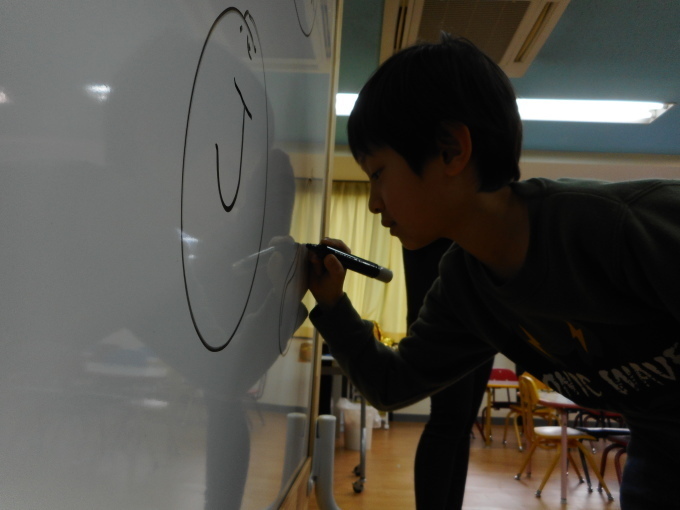 We wrote on the board many letters and asked to the kids to circle the call-out letters. 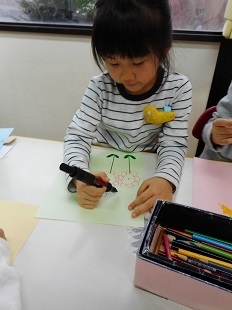 Then, it was their turn to writing down correctly the letters inside fruits that Aina drew. 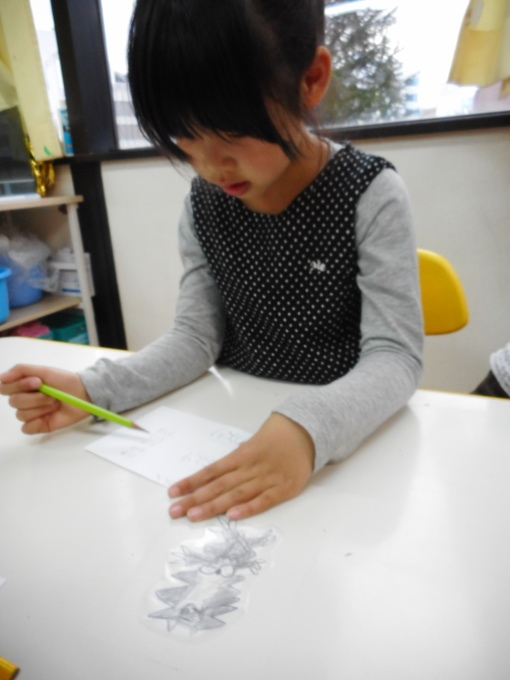 We had them writing down the letter X and Y on their worksheet and some of them were also able to write their name by themselves. They are getting better day-to-day. Meanwhile, caterpillar class was having free time. It`s been already few months that we planted radishes, we had time to observed growing and finally, today, we decided to eat them. 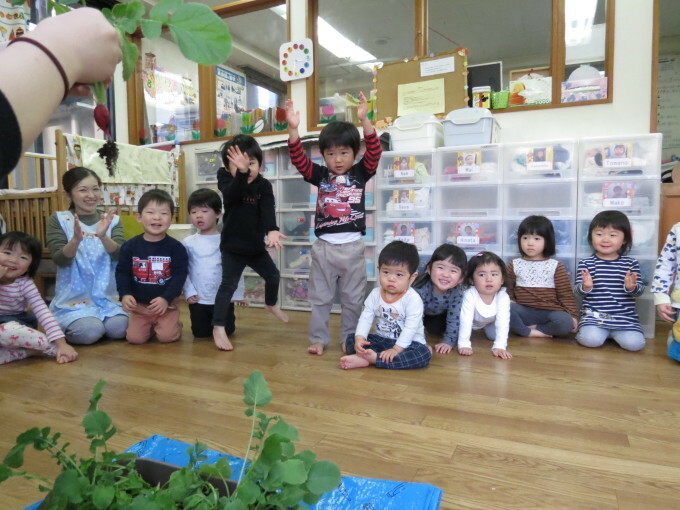 They added the leaves into a soup that Tomomi and Akiko teachers made for them, and they ate the radishes aside. They all asked for an extra helping but unfortunately the plant couldn't` produce more. 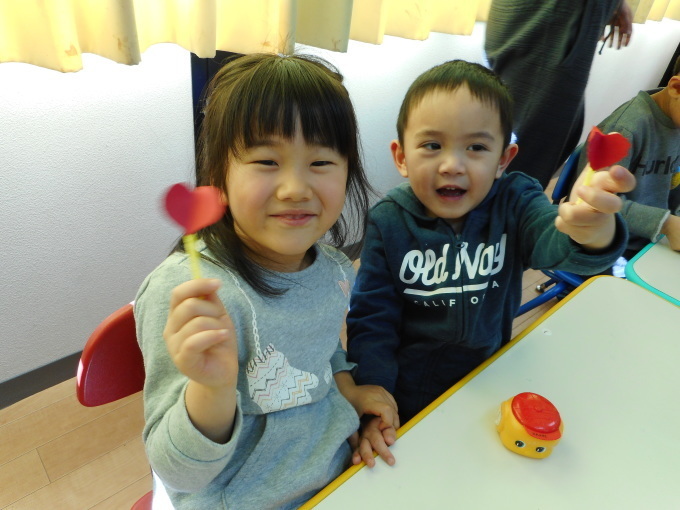 This afternoon, caterpillar class had English lesson with me and Aina teacher, we introduced a new theme which was the valentine`s day. We`ve learned few words as heart, valentine`s day and love. We made a fizzing heart project with baking soda and vinegar mixed with food coloring. 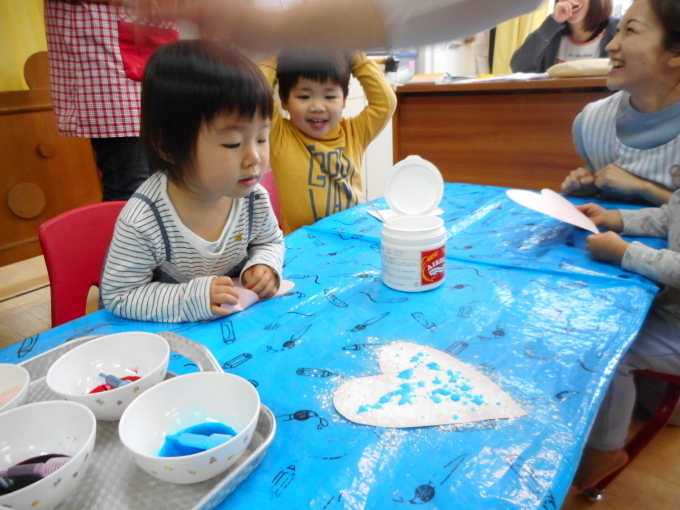 They had to spread baking soda on their paper heart fallowed by choosing their favorite colors and call them out in English, they were quite good with the name of the colors. They used pipettes to spread out the colored vinegar to start the fizzy reactions until slowed down. We had a great time as usually. 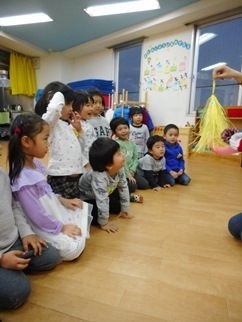 Meantime, butterfly class was having Japanese lesson where they`ve learned syllables ; Ra, Ri, Ru, Re, Ro. They had to write these down correctly as learned, on a piece of paper. 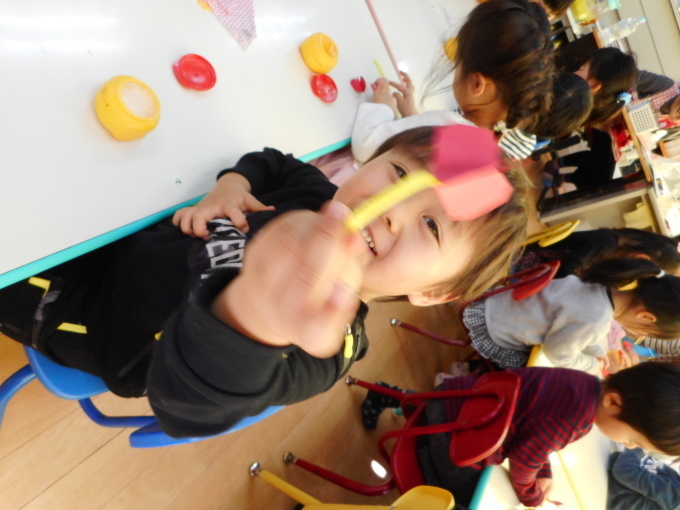 Then, the teachers asked to everyone to find out objects in the class or comrade`s name that sounds like the learned syllables. They had a real pleasure to do so. 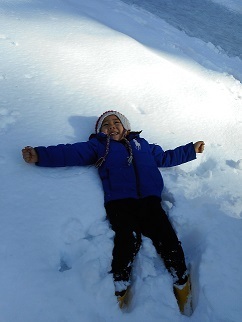 Today the kids had a lot of fun! 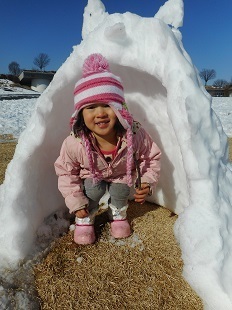 There were lots of snow outside so the Caterpillar kids decided to play with snow! It was such a beautiful sight, everything was white and peaceful and just magical. The Caterpillar kids were initially quite apprehensive about the snow. It was cold and perhaps they were a little bit hesitant. 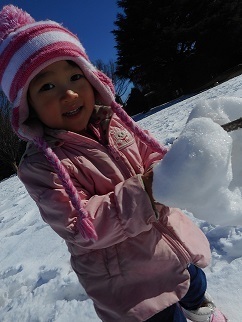 As they touched the white snow, they let go of their initial worry and started having fun! 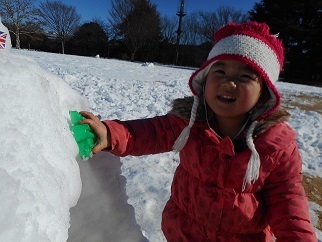 They were making snow balls and throwing them around. 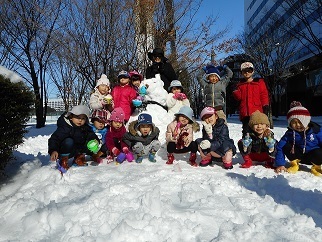 There was also a snowman that someone had built, standing proud in the park. Everybody loved it! 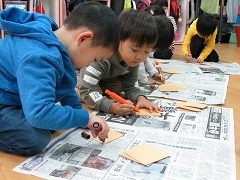 Meanwhile the Butterfly kids had their Arts lesson inside. They thought about what's gonna happen next month and someone mentioned, Valentine! 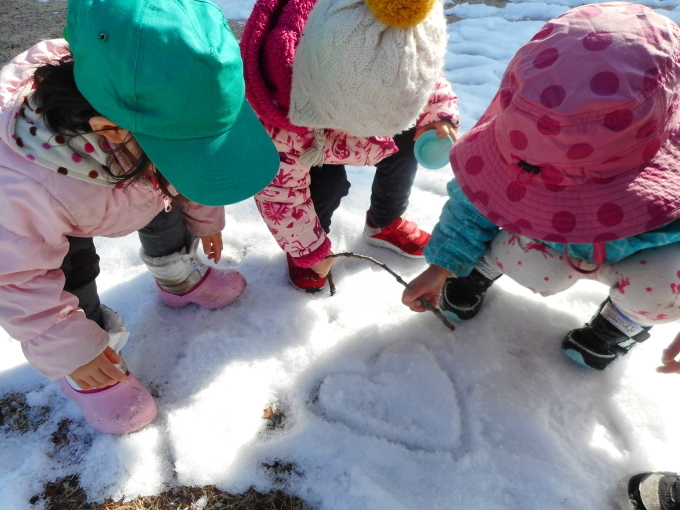 The kids thought about the symbol of Valentine, which is the heart and tried to reflect on the people closest to their heart. They mentioned their friends! Then, everybody had a piece of paper. They cut according to lines and made two heart-shaped holes on it. Then, they put the paper on top of another paper and filled in the holes with red and yellow. 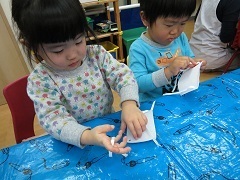 When they removed the paper at the top, they discovered two hearts on the paper at the bottom. It was beautiful! 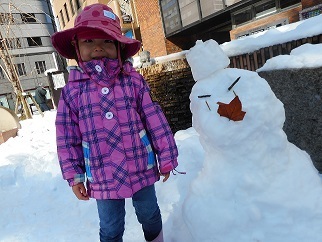 I hope it will keep snowing and everyone will have a shot at making beautiful snowmen! This afternoon, we made our first funny face flip book. Each of them had to draw facial features on little pieces of paper, in the top sections we could find the eyes, in the middle ones were the noses and in the bottom were the mouths. 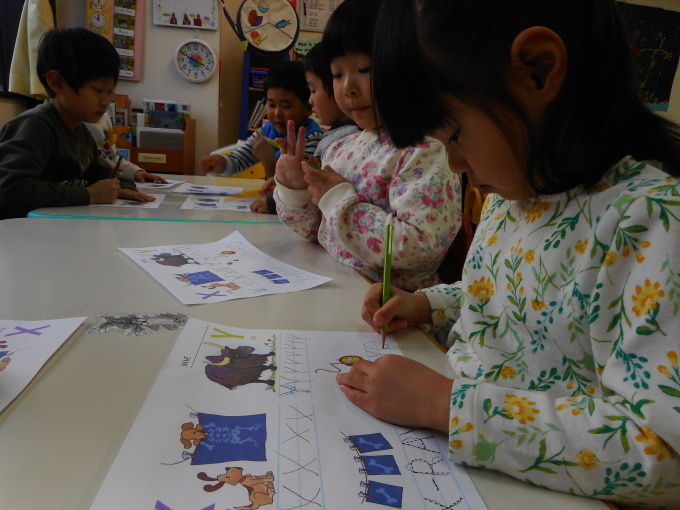 They also drew eyelashes, teeth, animal faces, tongues and other funny things that we weren`t able to identify. Then, we combined different features together to make silly faces. Everyone was laughing and we had such a great time all together. Have a nice weekend and see on Monday.